Last night I made dinner for my family. It was my first time really cooking much of anything and I was kinda nervous. But they turned out great! Everyone in my family loved them, site even Ella who is very picky about what she’ll eat for dinner. I’m definitely going to make dinner again soon! To start, I cooked 3 chicken breasts by boiling them. Then you saute together rotel, cream cheese, and the chicken. This mixture is so yummy! 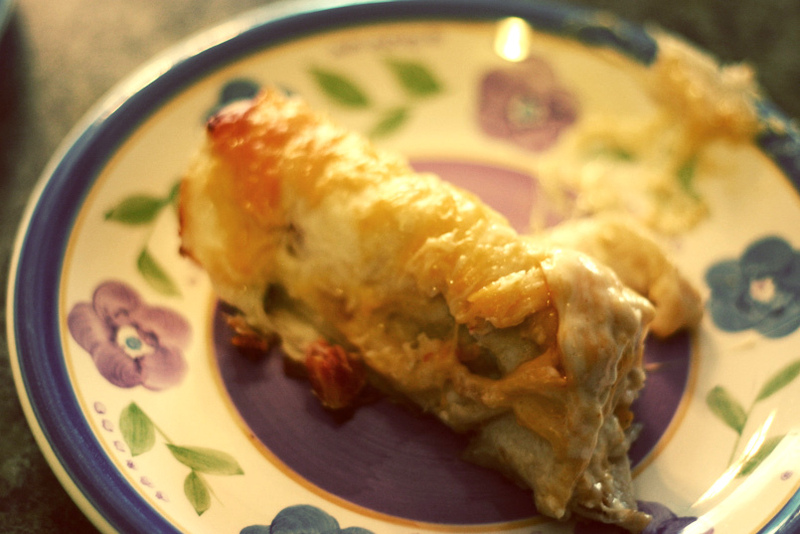 After that, you take a tortilla and put some of the chicken stuff in there and roll it up. You have to roll them up tightly. At first I was worried that all the tortillas wouldn’t fit in the pan. 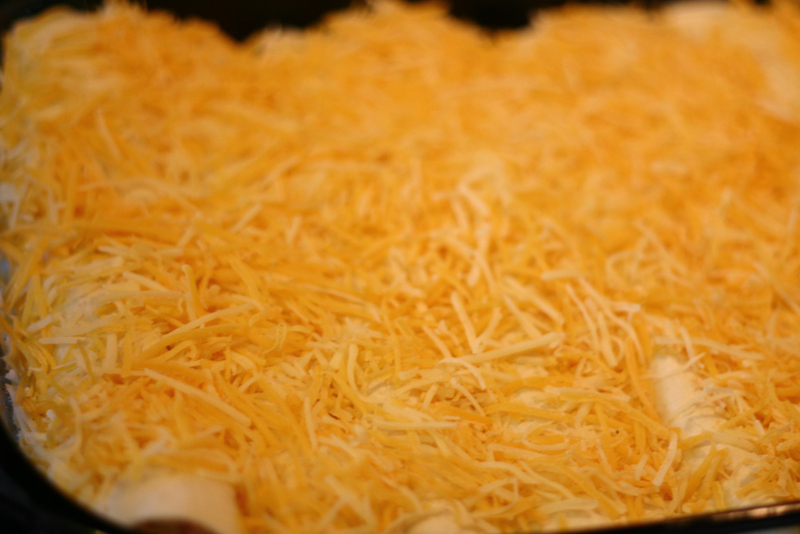 After they’re all in the pan, you cover it with cheese. Lots of cheese. Then you pour heavy cream on it. Lots and lots of it. The recipe called for 2 full cups of cream. I actually poured on a little less because it was SO much. Then you bake it for 30 minutes covered and like 15 minutes uncovered and it turns out all golden and delicious looking. And then you eat it! This picture doesn’t look great…I need a good macro lens! Well anyways, these were totally amazing and you should make them for dinner tonight. Seriously. To cook chicken, drop the chicken breasts in boiling water for about 20-30 minutes, or until chicken is no longer pink on the inside. You could also use already cooked chicken from the store or pan-fry the chicken. Melt the butter in large skillet over medium heat. Add rotel and saute 1 min. 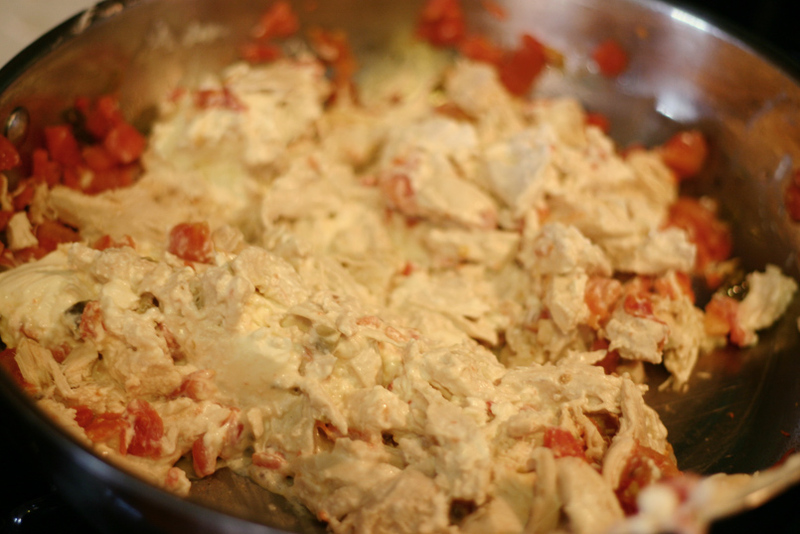 Stir in cream cheese and chicken and cook, stirring constantly until cream cheese melts. Put 2-3 tablespoons of chicken mixture in the center of each tortilla. 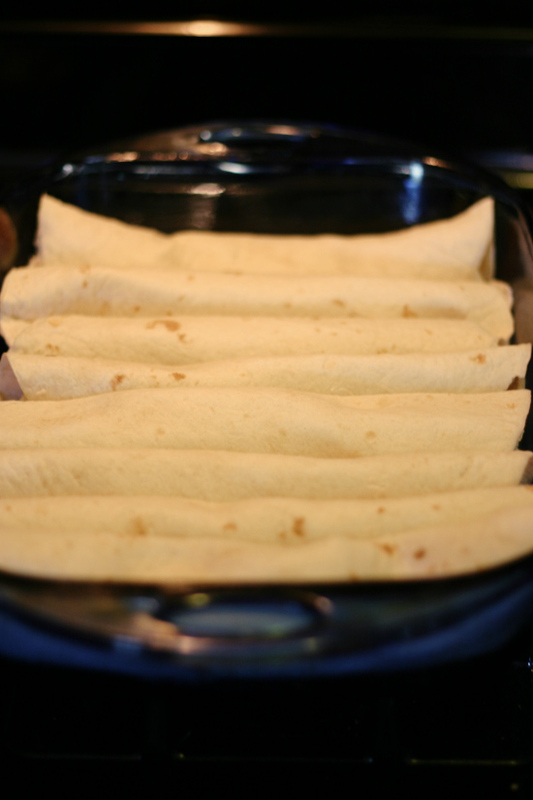 Roll up tortillas tightly and place them seam side down in the baking dish. 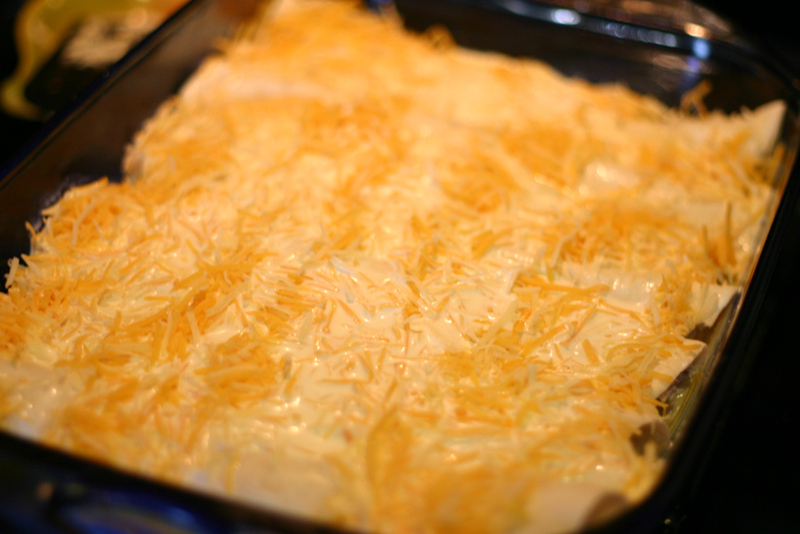 Sprinkle the tortillas with the cheese and pour on the cream. 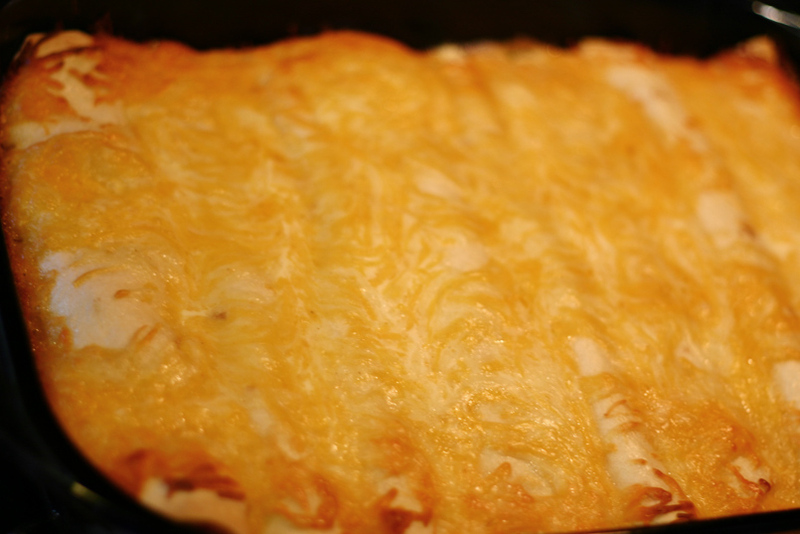 Cover with aluminum foil and bake at 350 degrees for 30 min. Take off foil and cook for another 15 mins, or until top is golden brown.